Passed peacefully at Northumberland Hills Hospital November 24, 2018 in her 95th year. 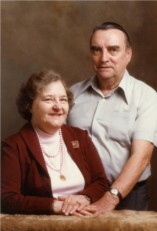 Beloved wife of the late Hector Bates. Cherished mother of Barbara Bates and the late Louise Prosser. Loving grandmother of Cameron, Greg, Sarah and Scott. Great grandmother to 7 wonderful children. Sister to Paul and Peter Shepherd and the late Gwen Lawaski. Jacqueline will be deeply missed by her loving nieces, nephews and friends. There is so much to be said about this wonderful, strong woman. She survived epilepsy, war, cancer, loss of children and more. She worked her whole life and had a family when no one thought she could. She beat all the odds and lived a full life. A celebration of her life will be held December 8, 2018 from 12:00pm-2:00pm at MacCoubrey Funeral Home, 30 King St. E. Cobourg, ON. A private family graveside service will take place at Cobourg Union Cemetery later that day. Condolences received at www.MacCoubrey.com. Saturday December 8, 12:00 to 2:00 p.m.